Every year my family participates in the Crohn’s and Colitis Foundation of America’s “Take Steps” Walk to raise money towards a possible cure to this horrible disease. The cause is very close to my heart because my husband has the disease and we live with it everyday. 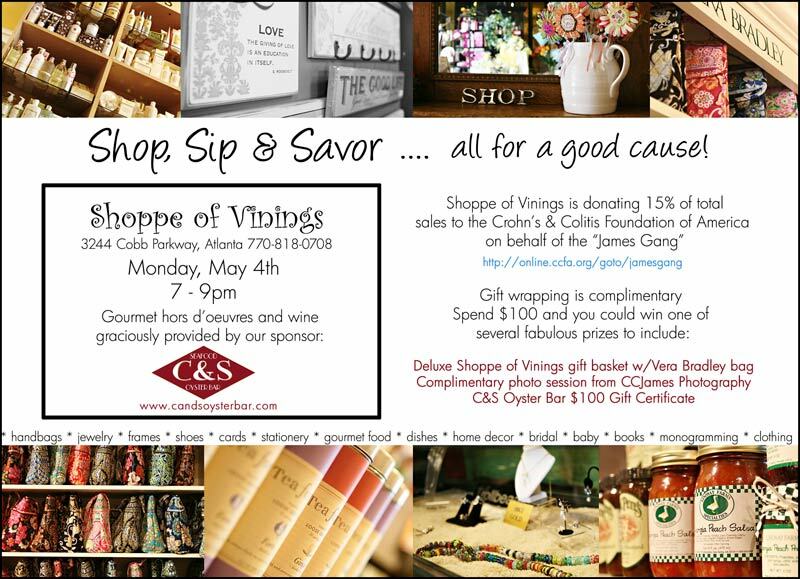 If you are one of my blog followers and you live here locally, I hope you will join us for a VERY fun event at the Shoppe of Vinings on May 4th to benefit this organization (details below) — I would love to see you! If you want to find out more about our fundraising efforts click HERE for our personal web page. We hope to exceed our goal of $5,000 again this year! THANK YOU SO MUCH to the Shoppe of Vinings and C&S Oyster Bar for sponsoring such a special event.